Russia-Azerbaijan relations are a factor of peace not only in the Caucasus, but also in the wider region, Director General of the Rossiya Segodnya news agency, popular Russian TV anchor, journalist Dmitry Kiselev said in a conversation with Vestnik Kavkaza news and analytical agency, Trend reports. Kiselev was speaking on the sidelines of the presentation of his book in collaboration with Russian political scientist, President of the Center on Global Interests Nikolai Zlobin. “Azerbaijan quite successfully acts as a kind of mediator between Russia and Iran, even a partner in our tripartite projects,” he said. Kiselev drew attention to the fact that the national leader of the Azerbaijani people Heydar Aliyev made an important contribution to the development of modern mutually beneficial and constructive strategic relations between Russia and Azerbaijan. 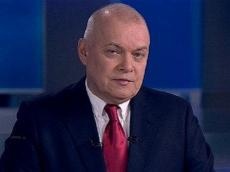 Speaking about the Caucasus as a whole, Kiselev noted that the region should remain self-sufficient and peaceful.